The financial argument for traveling light got even stronger this fall when American, Delta, JetBlue, and United raised their checked-bag fee from $25 to $30. Limiting your luggage to one carry-on bag can certainly save you money, but it can also seem impossible to anyone who’s used to cramming a big suitcase full of “just in case” for every trip. The first time Simona MacAngus traveled to Europe, more than 30 years ago, she took three large suitcases so that she’d have enough for her three-week trip. But taking a lot wasn’t a good idea. Keeping track of all that luggage on a trip with so many stops got “crazy,” says MacAngus, now 75. She says that trip inspired her to pare down for future trips. Now the Woodlands, Calif., retiree says she goes to Europe a few times a year with just one carry-on, no matter how long she’s staying. Paring down has made travel much more enjoyable. It’s easier and quicker to get to where you’re going, and once you are there, you can unpack more quickly. “When you pack light, you can concentrate on what your itinerary is going to be,” she says. But if you have less luggage, you also have to be smart about what you take and how you pack. The goal is not only to pack a suitcase that isn’t bursting at the seams but also to leave some room for souvenirs or other items that may come home with you, says Anne McAlpin, author of “Pack It Up: The Essential Guide to Smart Travel.” Otherwise, you’ll have to buy or take an extra bag to bring things home. 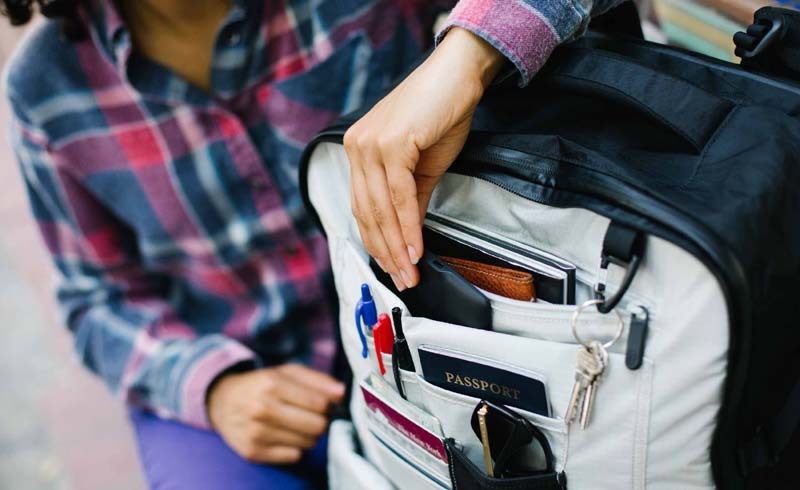 The key to making sure you take what you need is to start with a packing list, says Jennifer Snyder, a certified professional organizer who often helps clients pack for trips. The list should not include everything you might need but rather the items that you will need, including clothing, electronics, medications, toiletries, and documents such as your passport. Bonus: Take your list with you on the trip so that nothing gets left behind when you’re packing to return. Think through your itinerary day-by-day, check the weather, and be realistic about what you’ll do while away. You don’t need a week’s worth of workout clothes if you’ll go to the gym just twice. Rather than packing a completely new outfit for each day, take items that you easily mix and match into multiple outfits, so you can wear as many pieces as possible more than once. McAlpin recommends limiting yourself to three pairs of shoes and following the three-to-one ratio for clothing: three tops for every bottom. Also, look for ways to save space. Use travel-sized toiletries instead of full-sized bottles and take makeup or perfume samples in place of large cosmetic kits. Transportation Security Administration rules require that liquids be in containers of 3.4 ounces or less and that all of them must fit into a quart-sized resealable bag. Need to buy luggage? Read our luggage buying guide and see our ratings. Once you’ve established your list, be tactical about the order in which you place items into the suitcase. Put heavier items toward the base of the suitcase near the wheels to help prevent it from tipping over, McAlpin says. Next, fill in the suitcase with your clothes. For soft clothes that don’t wrinkle easily, rolling items will free up more space. “I started rolling instead of folding a few years ago, and it really makes a big difference,” says frequent traveler Becky Brown, 57, of Baton Rouge, La. Slide wrinkle-prone items into a dry cleaning bag or a large trash bag and lay them flat across the top, McAlpin says. The key to efficient packing is making sure that no valuable space goes unused. That means flattening scarves and belts along the perimeter and filling a half-empty dopp kit with rolled up underwear or socks in a small plastic bag, McAlpin says. Pack shoes toe-to-heel, and don’t leave them empty. Experts also recommend using compression bags or cubes to get even more space (although they won’t reduce the weight of your suitcase). These will also make it easier to find what you need in a large suitcase. If you carry a purse, put that inside a larger tote bag for more space to carry on if you’re flying. The tote can go under the seat in front of you, while your suitcase will go above.